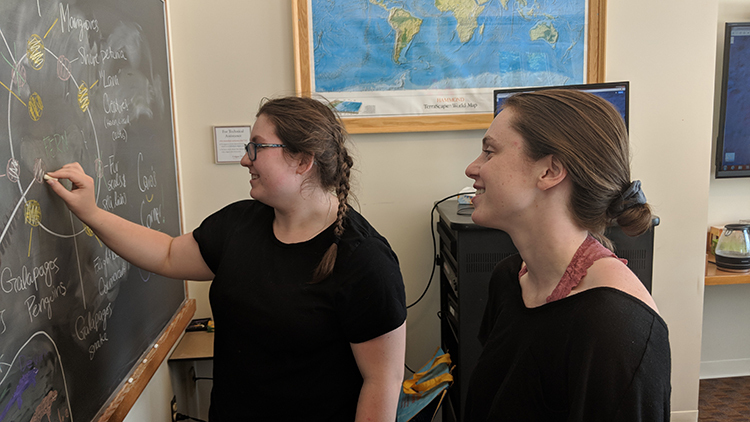 Visualizing the Galapagos Islands from Hamilton, N.Y.
During the summer months, Colgate students are fanning out across the globe to apply their liberal arts know-how in a variety of real-world settings, and they are keeping our community posted on their progress. 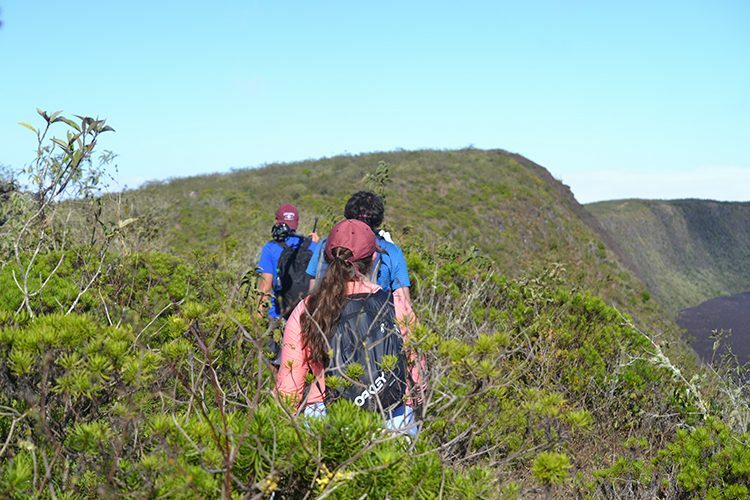 From her lab on campus, environmental geology major Emily Weaver ’20 (Auburn, N.Y.) details her work, which focuses on a faraway destination: the Galapagos Islands. Last year I worked on the beginning phases of a long-term project to teach children about science. This year I’m back to do it again. I’m part of a team of six students working alongside professors Karen Harpp and Alison Koleszar and Ho Tung Visualization Lab director Joe Eakin. The main goal of our project is to create an interactive platform that enables children to learn about the sciences and how the branches are interconnected. We chose to focus on the Galapagos Islands because they are a melting pot of scientific learning. Students will be able to navigate different 360-degree videos from the islands. Within these videos, they will be prompted to make observations and complete interactive activities that will allow them to come to scientific conclusions about the world they are experiencing virtually. The videos and images that we’re using for the app came from a trip that we took to the Galapagos last summer. After having worked on the project for a few weeks, we knew that, to make this app really immersive, we needed to have videos and pictures from the islands. This was the driving factor behind our trip and, while we gathered a lot of content, we were also better able to develop our ideas. Seeing the animals and volcanoes that we were researching in their natural settings and seeing firsthand how these different branches of science interact with each other made it easier to create interactive activities and storylines for our project. Being in the Galapagos also made clear to us that we needed to make sure that whatever we produced was useable by the children on the islands, too. This led us to work with a group at Arizona State University to find a way to ensure that our application is accessible across the globe — especially in the Galapagos Islands, where resources are limited. A typical day for us begins with a check-in meeting and long-term planning for the project. Then, we’re off to work on our individual pieces of the project. This can range from lesson creation and storyboarding to video editing, planning interviews with scientists, and programing what the app is actually going to look like. In the afternoon, we reconvene for a brainstorming session, where we troubleshoot anything that is tripping us up or find new ways to make the material interactive. Emily Weaver ’20 (left) and Katie Weber ’20 (right) brainstorm for their project. It is important to our team that the users are active participants in their learning. We want them to feel like they are going on a journey to learn about what interests them. That is why we are a taking a choose-your-own- adventure approach. We also want to make sure that children know there is much more to be learned in the world. Often, science is presented as complete; we want to show that this isn’t the case and that each new concept leads to more questions and concepts that are yet to be discovered. The best part of this project is the freedom we have to design what the platform is going to look like and what storylines we want to pursue. This allows us to try new things and brainstorm creative ways to present the information. Having a team that’s focused and excited to make something new and innovative is beneficial for creating the best project.